SEATTLE, Wash. (Jan. 8, 2019) — Want to learn everything there is to know about a subject? Go to the library. Want to learn everything there is to know about stars? Go to the stellar library. Renbin Yan, an associate professor of physics and astronomy in the UK College of Arts and Sciences, along with a team of astronomers from the Sloan Digital Sky Survey (SDSS), announced today the opening of a new “stellar library” containing spectra of thousands of stars in the Milky Way galaxy. Having access to this library will help astronomers understand not only our own galaxy, but galaxies across the universe. The announcement came at the annual meeting of the American Astronomical Society (AAS) in Seattle. The new library is known as the “MaNGA Stellar Library,” named after the SDSS’s Mapping Nearby Galaxies at Apache Point Observatory (MaNGA) survey it was designed to support. MaNGA’s goal is to understand the detailed internal structure of galaxies — but of course galaxies are made of stars, so understanding a galaxy requires understanding the stars that compose it. For decades, astronomers have been trying to figure out what unique mix of stars best explains the light that we see from every distant galaxy. For galaxies, the “music” is the light coming from the mix of stars that make up a galaxy, along with its detailed history of star formation. 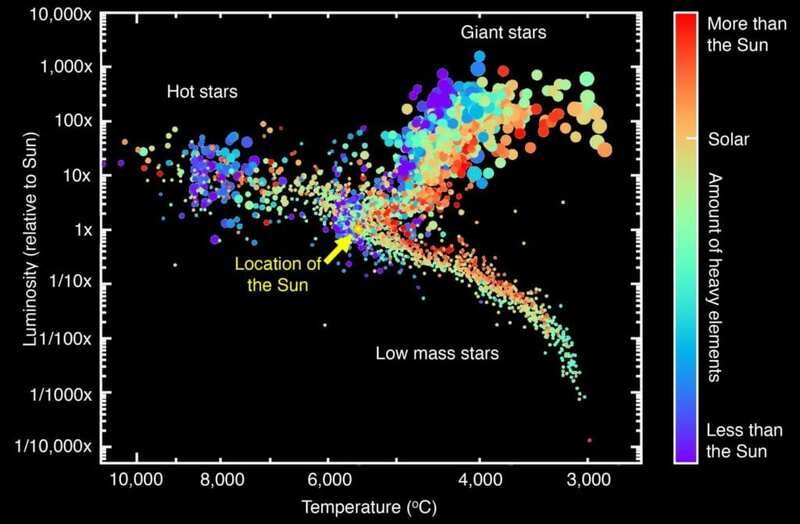 The problem is that other galaxies are so far away that astronomers cannot distinguish individual stars in them. The solution is to study thousands of stars in our own Milky Way. Once they identify all of the possible “instruments” using stars in the Milky Way, they can decipher the “music” of distant galaxies. In a symphony, the sound of each instrument has its own unique tone; in the case of galaxies, the light of each type of star has a unique spectrum. A spectrum measures how much light a star gives off at different wavelengths, a pattern unique to each type of star. Like sheet music shows how a song will sound, “reading” a spectrum gives important information about a star, like its temperature, size and chemical composition. By observing thousands of stars of all types, astronomers can build up a “library” of stellar spectra. Thus, when they measure the spectrum of a distant galaxy, they can try to build the spectrum by putting together different combinations of stars from the stellar library until they find a combination that fits. Those accurate spectra come from the spectrograph of the MaNGA program. MaNGA spends most of its time observing galaxies, but over the last three years, it has also measured spectra for more than 3,000 stars of all colors and sizes. These spectra have been collected into MaStar. MaStar began out of necessity. At the beginning of the fourth phase of the SDSS in 2013, the MaNGA team realized that there was no suitable library of stellar spectra for their survey. Rather than be stymied by the lack of such a library, the team realized they had an opportunity to create such a library by working with the other survey programs that make up the SDSS. Yan says what makes the MaStar project possible is the parallel observing capability in the SDSS. Thus, with this strategy of “piggybacking” on other SDSS observations, researchers from the MaNGA team were able to get the right spectra for the right stars to create the stellar library they so desperately needed. All the spectra for all these stars have been released as part of the SDSS’s Data Release 15, and are available online through the project’s website at http://www.sdss.org. Once astronomers have a library that includes the light spectra for as many types of stars as possible, they can figure out how many of each type of star add up to make the galaxy spectrum, and thus understand the galaxy’s history of star formation. In Yan’s analogy, they can understand which instruments are making the music. The key is to include as many types of stars as possible in the library. And the MaNGA Stellar Library will just keep growing. With observations continuing at Apache Point Observatory until at least 2020, it will become the biggest and most inclusive stellar library ever made.